"Perhaps in the not-too-distant future, governments have advanced beyond those of today. Control of cities and civilisations is handle from central control points." I don't know about you, but this summons up visions of computer-controlled systems with megalomaniacs operating them. "Big brother" policies towards the population is the common method of social control and any anti-government attitudes will be severely dealt with. Yes, very bleak indeed. Mind you, it would seem pretty silly and inappropriate to have a story lien that went something like this: "Perhaps in the not-too-distant future, governments will abolish taxes and depravation along with homelessness and wars. Everyone must wear flowers in their hair and chant peace, love and happiness. Mary Whitehouse shall be appointed supreme overseer and censor of all forms of media and her word is final. In fact, the world will be a very spiffing place to live in indeed." You'd be hard-pressed to come up with a good game from this kind of background, wouldn't you? And if someone did come up with a game simulating such a world. I'd bet my entire collection of Mr Bean videos that that person would be French. Anyhow, the first scenario is that which applies to Global Effect. It may be bleak, but it certainly does make for an interesting game. In essence, Global Effect is very much in the vein of Sim City. You are a government leader, assigned control of either a new or existing world, depending on the options chosen at the start of the game. Your task is to ensure the continued survival of both your people and the environment. You are given information about the status of your people and of the effects on the environment of any actions you take, such as clearing forests to expand your community or creation of oil or coal mines used to fuel power stations and so on. Depending on which scenario you chose at the start of the game, you may also have to contend with opposing parties who pose a threat to your own people. In this situation, you have a number of military options to choose from. These including building control centres and early warning radars, as well as constructing air and naval bases with nuclear or conventional weaponry. Of course, any nuclear conflict can also cause massive damage to the environment so this has to be taken into consideration before entering into a major battle. As mentioned earlier, there are a number of options to choose from that will decide your role and goals within the game. For instance, you can assume control of an existing colony, where previous leaders have ever-so-slightly buggered up and it is your job to repair the damage. Alternatively, you can attempt a completely new command, starting on a world of your choice. 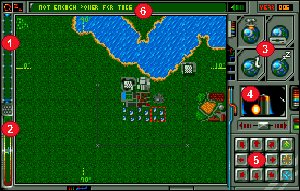 When playing the game, the screen display shows a portion of the map of the world which you are attempting, along with various command icons, message windows and status displays. Your build your colony using a selection of icons which represent such objects as city blocks, power stations, water purification plants and even sewage treatment farms! To be able to construct these objects, you need to have sufficient game power. This is represented by a bar on the far left of the screen and increases if your colony and the environment have a good rating, or decreases if they have a poor rating. If game power gets to a low level, you may not be able to afford to build the required object. One of the first objects on your list should be a power station. You have the choice of either oil-powered, coal-powered, solar-powered, wind-powered and ultimately, nuclear-powered stations. Of course, these have differing effects on the environment which must be taken into account, but once a station is operation you can build power lines across the land to join up to city blocks. When you build a city block, it will be dark, meaning there are no people in it. When you hook it up to the power station via the power lines, it comes to life. From there on, your city will begin to develop automatically as new city blocks begin to appear. You have to be careful not to let the development increase too quickly or you will find the game power will start to decrease. As your colony grows, it will start to require basic services such as waste recycling and water supplies. Any deficiencies in these areas contribute to a poor colony rating. There are ways of controlling the colony and these involve building city limits to prevent expansion beyond a certain boundary, thus keeping the population to a reasonable size. You can also use green belt boundaries instead of city limits. These are more environmentally friendly and will add to your environment rating. To aid in maintaining a balanced colony and environment, you have a number of information screens that help you decide what measures to take. Via the environment and economic data icon, you can receive information on such things as carbon dioxide levels, ozone layer levels and air pollution to name a few. There is also a seismic survey mode which allows you to search for natural resources for mining. You can view the entire world map here too. I enjoyed playing this game a lot. There's a fair amount to do, but not too much to make it overwhelming. Of course, you are able to save your game should your omnipotent control of the people have to be postponed due to mum shouting 'dinner's ready'. Sound effects are not abundant, but this doesn't detract from the game at all. What makes Global Effect so good is that everything you do has a knock-on effect on the environment and economy, so you are kept on your toes all the time. Even natural disasters such as earthquakes can occur, causing unforeseen damage to your colony. Once you master the wealth of control icons, the game is very playable. You may find it a little frustrating at first when you get messages about problems with your colony and you don't know why it's happening, but persevere and you'll be hooked. There is also my most favourite of features, the good ol' ability to play against a human opponent via serial link. Nice one, Millennium. If you liked Sim City, then this is the game for you. A strange game this 'un, and no mistake. Take the god-gameplay from Sim City and combine it with the war-like tendencies of Powermonger and you have a game which refuses to fit neatly into any category; that game is Global Effect. In short, it's a 'grow-you-own-planet' simulation that takes things like global warning and ozone depletion seriously, but still allows you to wage thermonuclear war against neighbouring countries. In practice, it's as hard to play as it would be to solve the world's ecological and economic problems in one afternoon's sitting. Global Effect offers a number of possibilities to the wold-be god-head: you can create your own world, save a damaged one, or attempt to dominate a world before it's wrecked by a rival god. Each option has a different spin on the basic theme - gain total power, but protect the environment, man. Whichever scenario you choose, the same tools and techniques are used to build or stablise your world. You switch to a large fractally-generated map screen banked by a control panel. The map shows only part of the planet (the entire world is many screens larger) and it's initially centred on your home position. This may be a blank area (if you've selected the creation option) or it may contain a living, breathing city. If you're likely to use military forces (planes, missiles and boats), you need an HQ, but the most important buildings you create are city blocks. These need to be powered to make them work, so power lines are required to link to your generating station. Once you've established a city or two, they begin building automatically, expanding the city further. You can (and must) limit this to a manageable level, or you run out of power and your game grinds to a halt. You also need to install vital services like farms, sewage treatment, reservoirs and recycling plants. Without them, your cities collapse almost as quickly as they build, turning vast areas into wastelands which are expensive to repair. Make or break usually occurs within the first 10 minutes. If your initial surveys and attempts at starting a city are flawed, you may find yourself stumped. This is because your ability to do anything depends on your level of economic, military and electrical power. If you've spent too much on ill-fated plans and you're messing up the environment in the process, the power level falls drastically. This can leave you with a global crisis without the power to examine the status displays to see what the trouble is. In extreme cases, you may find you can't scroll the map to check on a certain part of your city. Frustrating is the word, sitting there, watching your world turn to brown stuff (wastelands) without being able to do a single thing (except to quit or pause). It's enough to make you turn purple and blow a vein or two. It's a case of "neat idea - shame about the gameplay", which is sad. There's a serious contender to classic Sim City, Railroad Tycoon and Populous, going to waste here. Why? Because the whole concept is too erratic to handle. For the green player (in both novice and eco-friendly terms) who doesn't have a masters degree in Gaea and Chaos Theory, there are too many variables to control at once. Playing against the computer opponent is more difficult because it doesn't have the human disadvantages of learning or having to think for more than three nanoseconds. Games against human opponents are more fun, because you both tend to be slow-witted. Without a doubt it's well-researched, topical, cutting-edge stuff, but it just doesn't feel like a game. It would probably be a useful tool for teaching students (and selectively-deaf politicians) about the importance of cause-and-effect on the earth. But for entertainment, well, it's a bit like expecting a mandelbrot generator to have end-of-level guardians. Unless you're intending to use it as a demonstration tool at the Earth Summit, give it a miss. Too complex for its own good. Incredibly frustrating, even on your tenth attempt. Smart graphics and stunning sound fail to rescue it from disaster. If you're really eco-conscious, and have the patience of a saint, it's worth it. Wie hat Euch eigentlich "Sim City" gefallen? Toooll, aber ein Gegenspieler wäre halt schön gewesen? Wie bitte, mit der Ökologie hättet Ihr auch ganz gerne ein bißchen exerimentiert? Ja, dann holt Euch doch einfach die neue Echtzeit-Simulation von Millennium! Denn als allgewaltiger Chef einer außerirdischen Kolonie darf man hier seine städtebauerischen Fähigkeiten wahlweise alleine ausleben, an einem cleveren Computergegner messen oder gar per Nullmodem gegen einen gleichgesinnten Spezi um die Wette zivilisieren. Die Lebensqualität (Durchschnittstemperatur, Bodenschätze ysw.) des zu besiedelnden Planeten kann ganz nach Belieben eigestellt werden; daneben warten acht fixfertige Szenarios von der Eiswelt bis zum Regenwald auf biodynamisch wertvolle Kolonisten. Wie oder wo auch immer, zunächst setzt man in bester Sim-Tradition ein paar Stadtviertel in die Pampa, welche von einem Wind- oder Solarkraftwerk versorgt werden sollen - denn hier haben Energieverschwender schlechte Karten! Damit wir uns richtig verstehen, die Rede ist erstmal von einer spezifischen Game-Power, dem Mana aus "Populous" nicht unähnlich. Alles, was man tut oder baut, kostet ein Quentchen dieses Lebenssaftes, andererseits wirft eine florierende Kolonie ja genügend davon ab. Leider gilt das auch für Dreck und Industrieabfälle, welche mit Recycling-Centern und Aufbereitungsanlagen entsorgt werden müssen; andernfalls verpufft die kostbare Energie, ja es drohen gar Umweltschäden bis hin zur Klimatkatastrophe. Gottele, dann bauen wir halt mehrere kleine Städtchen, um an unser täglich Mana zu kommen. Gute Idee, nur leider ist die erforderliche Benutzung von Übersichtskarten, Tabellenmaterial und dergleichen ebenfalls nicht kostenlos, selbst fürs Terrain-Scrolling muß gelöhnt werden! Zudem wachsen die Orte ganz von alleine weiter (auch wenn man sich nicht um sie kümmert), was dem Spieler zwei bis drei Striche durch die ökologisch ausbalancierte Rechnung machen kann. Damit nicht genug: Erdbeben erschüttern die Scholle, man kann Bergbau treiben, um Kohlekraftwerke zu versorgen, für Atommeiler nach Uran buddeln, Farmen anlegen und sogar (auf rein strategischer Basis) gegen den oben erwähnten Widersacher zu Felde ziehen. Daß derlei kriegerische Aktivitäten jedoch dem Öko-Gleichgewicht nicht unbedingt zuträglich sind, kann man bereits an den ebenfalls verfügbaren Katastrophen-Szenarios ermessen, wo z.B. eine postnuklear verseuchte Welt der Rettung harrt. Aber auch an zuviel Kohlendioxid, Ozonlöchern und vergifteten Böden darf man sich versuchen. Die Umweltfreundliche Welten-Simulation präsentiert sich wie beim Maxis-Vorbild in grafisch schlichter (und kaum animierter) Vogelperspektive, neben dem großen Terrain-Fenster pflügt die Maus durch ein Feld mit diversen Steuericons. Vom Sound ist eine nette Titelmelodie zu vermelden, die drei FX vergessen wir besser. Global Effect - Ökologie, die Spaß macht! Spezialität: Zwei Disketten, 1MB erforderlich, komplett in deutsch. Nutzt auf Wunsch das ECS-PAL-Format. Odd, isn't it, how quickly our expectations change? In the old days, fore example, motor cars were thought of as pretty exclusive, the preserve of the rich; now everyone has got one. Bread and jam was once a rare tea-time treat; these days you can bite into a marmalade sandwich any time you like. And now, thanks to games like Populous, Sim City and Mega lo Mania, even becoming Supreme Master of the Universe can so easily be taken for granted. Global Effect is a ruling-the-world game with a 'right-on' slant. So as well as building up cities and armies, at the touch of a button you can call up global warming charts, ozone layer surveys and carbon dioxide readings. You can also plant sustainable forests and build recycling centres and I'd be surprised if there is not an option for setting up women-only vegetarian drama workshops buried in here somewhere. But, er, back to the armies and things, eh? The snag is, before your troops can start advancing across the globe you have really got to establish some sort of economic infrastructure to support the industry necessary for producing the machinery of war. And in that respect, Global Effect is extraordinarily similar to Sim City (only not so good). Cities are built up out of just the same sort of building units - blocks of flats, power stations, cables, pipes - although sadly there are no sports stadiums or airports, and no roads with little cars driving along them. (Shucks). Instead, Global Effect places the emphasis on fuel resources and waste disposal. Coal is easy to find and mine, but produces lots of carbon dioxide, while uranium is scarce but provides lots of pollution-free electricity. You have also got to make sure each city has a water purifying station and a sewage disposal plant, with pipes leading to the sea. Oh, and how easy it is to build depends on the sort of environment you are dealing with - this can be selected before the game starts (ice age, forested, post-holocaust etc.) and supposedly changes depending on how you take care of it. But that is all boring stuff. I know what you want to hear about: BLOWING THINGS UP. Er, I would not hold your breath, but there are some basic facilities available. Once your 'power meter' is high enough you will be able to start building air and naval bases, from which you can send out planes and boats to attack the enemy. These can be programmed with courses, and then switched over to manual if any precision bombing is called for. Boats are a bit crap, as they take ages to get anywhere, but planes can be loaded up with bombs and flown in huge formations towards enemy cities. You can probably imagine what happens when they get there. (Do not get too wild with anticipation, though. There are no explosions or anything. Buildings just vanish, to be replaced by brown wasteland). Global Effect's graphics are a bit useless all round, actually. They look okay from a distance, but when it comes to actually working out what is what you begin to realise how hastily they must have been knocked up. A nuclear power station looks pretty much like a block of flats, as does a recycling plant and a coalmine. And electricity cables are practically impossible to make out against the background, and never seem to connect up to things properly. (Neither do pipes). Another annoyance is that the map does not have wrap-around (so much for 'global'), so to bomb something on the other side of it you have got to fly all the way around the world, even if your target is technically just round the corner. Tch. Oh yes, and every time you want to put something down on the map you have got to spend ages scrolling through a list of options, one by one, until you get to the one you want. Pull down menus would be miles easier. But if you reckon that is my vitriolic quota expended for the month, take a firm grip on the magazine with one hand and peek nervously between the fingers of the other: there is something else, something much worse, and it is making me mad. (I hate it when this happens). It is the 'power meter' thingy. You know how at the beginning of Populous you cannot really do much, as you have only got enough energy to build a few bits and pieces, only it is okay because after a couple of minutes play your power goes shooting up and you are away? Well, Global Effect is the same, only rather than 'minutes' we are talking 'hours'. It is terrible. You can build about three city blocks and a couple of solar panels, and then you run out of power and cannot do anything else for ages. You are even denied simple pleasures like scrolling the map around, as that needs power too. 'Frustrating' is not the word. I cracked it, though. Boy, did I crack it. The answer, I eventually discovered, was to spend the first ten minutes or so furiously planting as many trees as the blasted 'meter' would allow - hundreds of the things - and then sit back and watch my power rocket up. (Power, you see, is calculated from a combination of economic and ecological success, and as planting trees is deemed by the program to be an ecologically sound thing to do, you get loads of power for it). I was then able to build loads of air bases and bomb the crap out of the computer. Quite how planting trees should give one the ability to build planes and bombs is beyond me, however, and points to a fundamental flaw in the way the game does its sums. And that just about sums up Global Effect if you ask me - flawed. The environmental angle is admirable, and has been quite well integrated with the basic Sim City sub-structure. And the military side is great, getting the job done without becoming too wargamey. But, when it comes down to it, monitoring holes in the ozone layer just does not make for a particularly riveting game (even if you do get to grips with the power meter). I never found myself wanting to stay up all night to play it (like I used to with Sim City), or being moved to tears when one of my settlements was overcome by the enemy (as with Powermonger), or getting really annoyed when I kept swallowing bits of tin foil (as with those new 'chunky' Dairy Milk bars). I must admit it feels a bit weird giving such a big, complicated game from such a highly respected publisher such a weedy mark, but I would be fibbing if I did anything else. Sorry. A surefire way to have fun in Global Effect is to blow the other player's cities to bits - a bit like the way you play Utopia in fact. For that you will need an airforce. And a navy. (You can tell this one is going to be a naval base because I have put it next to the sea...). UPPERS Great if you feel your social conscience needs exercising, and if you really stuck with it you might eventually strike up a chord with the strategy side. (Or at least get some fun out of the bombing bits). DOWNERS But it just does not hang together. Building cities has been done better loads of times before, and the rest adds up to nothing. The game seems to have been designed to make things as awkward for the player as possible without making up for it in other ways. I care about the ozone layer, really do. But I do not really want to have to sit there staring at it when there are so many other great games I could be playing. File under 'interesting failures'. The Green movement's bandwagon may have been derailed some time ago, but that hasn't stopped Millennium trying to jump on board with a Sim City-style game tinged with environmental sensibilities. The time is the not-too-distant future, where global development is handled by omnipotent world controllers. Your task is to develop a world's natural resources and build a thriving civilization. Of course, it's not that simple, and each world's enclosed ecosystem is vulnerable to your industrial advances and the plundering of its mineral wealth and other natural resources. It's up to you to balance the specific economic and environmental concerns of your chosen planet and successfully guide your citizens towards a prosperous future. The game offers three main options. You can either choose to save a world from an environmental catastrophe, build up a new colony from scratch on a virgin world or become embroiled in a deadly war with a rival controller. Whichever option you plump for, the various scenarios ensure that you'll have your work cut out to stay in power. Not only will you have to contend with natural phenomena, like earthquakes and volcanic activity, but on some worlds there's also computer-controlled adversaries who couldn't give two hoots about either yours or the planet's good health. The 'save a world' option involves four scenarios. The first of these is set amid a nuclear winter where large parts of the planet are uninhabitable, the polar ice-caps are expanding towards the equator, and few people have survived. Your ask is to reverse the ecological damage and help civilization to thrive once more. Whether this would be possible after a real nuclear conflagration is extremely debatable, but as this is a game we'll let them get away with it. Other scenarios offer a post-industrial society poisoned by its own pollutants, a world in the grip of global warming, and another exhausted of all its natural resources. In the first of these,a new world order has to be established based around clean, green, energy-efficient policies while the other two require speedy action to reverse the global rise in temperatures and to maintain the existing civilization at an optimum level to ensure their long-term survival. If you're more concerned for your own good fortune than that of your people, the 'rule a world' option will be more to your liking. Here, you have the option to become involved in an industrial confrontation with another controller where rampant industrialisation and expansion by your rival needs to be contained and reversed, or there's the much more appealing arms-race scenario which sees both sides stockpiling nuclear arsenals for an eventual military engagement. Unfortunately, much of this option's appeal is muted as the environmental concerns have to be taken into consideration. By launching a first strike you may well catch your opponent off-guard and thus win the battle, but the war with the environment will be well and truly lost. The final option allows the controller to develop a number of virgin worlds. It's possible to start from scratch on a fully customisable planet or choose from a number of scenarios. There are eight of these, each throwing up individual environmental problems, ranging from volcanic activity and frozen worlds to mineral and fossil rich planets. The main game screen consists of a window display which offers a birds-eye view of a tiny section of the planet's surface. To the left of this is an icon selector which contains the assorted construction tools necessary for global management. Unfortunately, only the currently-selected icon is displayed at any one time and it's necessary to scroll through the numerous tools to find a particular item. A much better option would have been a Sim City-style icon panel but, instead, Global Effect uses a very tedious display, which becomes a distinct irritant the more you play the game. To be fair, it's possible to program the function keys to take on the different icon characteristics, but it's still a cumbersome system. To the left of the display area are two information meters which detail your economic/environmental rating as well as your power elvel. Any movement or construction requires power which, in turn, is generated by your economic performance and how well you're managing the environment. To move around the map, there's a compass to the bottom right of the screen and it's also possible to move the mouse cursor off the main screen to dictate movement. Once you've started to build something, messages at the top of the screen inform the player how well they're doing. For example, 'very good drainage', 'commendable farming coverage' and 'well organised recycling network' are common. Encouragements. Equally common, though, are messages stating 'your city is in need of repair' or that 'your citizens are dying'. Global Effect certainly looks the business. The icons used for the different tools are all fairly straightforward and there's no real need to consult the lengthy manual to discover their function. Keep an eye out for the icon which denotes the sewage treatment works - I think I could have come up with something better than a beaker of water and a big brown pile of excrement! Sound-wise, there's not a lot to say, except that I'd have preferred a meatier selection of sound effects and decent atmospheric music. City construction isn't as detailed as Sim City. The game is more concerned with effects rather than detail. There's no need for hospitals or police stations as the action takes place primarily on a global scale. City blocks are just that - tiny squares which can be linked together on screen to form an expanding metropolis. Other tools include farming units, water reservoirs, recycling plants (naturally), solar generators and sewage treatment plants. Once you've got your basic city unit up and running, it's then time to consider adopting coal-driven power stations or the much cleaner option of nuclear power. Once your city has expanded to a certain limit, environmentally-friendly sources of power, such as wind or solar generators, become inadequate and economic forces dictate the development of more 'advanced' energy sources. This is when problems start to arise and it's a complex balancing act to keep both the environment and your economy in equilibrium. This might sound and incredibly dull idea for a game and, admittedly, there are times when things become rather routine. It can take a long time to build up a city-state and even longer before your actions begin to have an effect on the environment. Initially, the most exciting things to happen are breakdowns in the sewage disposal system or an outbreak of dysentery, but things do start to improve the more you get into the game. There's a sense of achievement in slowly building up an embryonic city and an even better feeling once you've built up an atomic arsenal and launched an all-out nuclear war! Despite the game's many good points, such as the well-thought out scenarios and myriad number of options, I couldn't help feeling that something was missing. That something happens to be one of the most important ingredients that goes into a successful game - originality. There's nothing new here except an over-zealous environmental consciousness which casts its shadow over the entire game in a rather crude and intrusive manner. It's obvious to see where much of the inspiration has come from: Sim City is the chief point of reference, but Bullfrog's Populous, Gremlin's Utopia and Maxis' Sim Earth have all been plundered for ideas. If you're going to borrow ideas quite so liberally as Global Effect has, then then final game has to be as good as, if not better, than the original products. Sadly, this is not the cas, and I'm left bitterly disappointed with what could have been an excellent god-sim but, in reality, is more like a Green Party broadcast. That's not to say there isn't any fun to be had in creating your own environment and carefully nurturing it. It's just that I can think of many better games to spend my money. Global Effect is more of a game than the open-ended Sim Earth. There are set objectives for each scenario and most tasks have to be completed within a certain time. One of the more interesting options is the chance to wage global war against a computer component. This involves establishing an operations centre (HQ) before commissioning air and sea bases as well as early warning systems, missile sites and anti-missile batteries. Conventional bombs destroy an area consisting of five blocks (out of a total area of more than 60,000 such blocks), and causes minor pollution and contamination. A nuclear explosion causes widespread contamination of a large area. If more than 30% contamination results from a nuclear conflict, no further actions can be taken until radiation levels have died down. The worst possible scenario is a nuclear winter which is effectively 'Game Over'. SERIAL KILLERS By connecting another machine to your Amiga via a null modem cable, it's possible to have a head-to-head confrontation against another player. It doesn't matter whether the second machine is a Macintosh, PC or an ST - Global Effects can be linked up to all of them and then you and a friend can wreck industrial suicide on some poor unsuspecting planet. There's also an option to play the game via a modem, but due to the vast amounts of data transfer involved, Millennium advise against using this option. Better yet is the computer opponent. There are various parameters that can be set, such as the computer's economic ambition, its speed, and its military intentions. Initially, it's best to use a low setting, or else you'll soon find yourself out-manoeuvred both economically and strategically. The power gauge works as a credit rating and limits development. Construction can only take place if there is sufficient energy available. The economic and environmental meters monitor how well your economy is performing and the degree to which your actions are affecting the planet. If both are okay, you'll gain more power. This back of icons allow you to save or pause a game, get strategic information or begin a military build-up. The icon bank offers 30 different construction tools. Once selected, the current tool can be placed onto the main screen by simply placing the mouse cursor on screen and clicking the mouse button. The compass is one way of moving about the map. Another is to drag the mouse off each side of the screen, whereupon it will scroll accordingly. Occasional messages appear at the top of the screen, informing the player how well they are doing and of other major game-releated events, such as earthquakes or volcanic eruptions. As a peace-loving earth child with flowers in his hair, Martin Pond skipped and danced barefoot through the forests on hearing he was to review Global Effect from Millennium. My, what a jessie! Global Effect is one of those smart games that lets you create your own utopia and then surround it with nuclear power stations and sewage works. The computer generates a world for you with continents, oceans and ice caps. It places a smattering of mineral deposits beneath the land, traces out a web of seismic fault lines, and creates an atmosphere with a certain temperature and ratio of constituents. Et Voila! It's like a Pot Planet, it's that instant. There are a number of stock scenarios featuring stuff like Ice Ages, nuclear winters, global warming, earthquakes, volcanoes and pollution. The remedy for these situations usually revolves around planting trees, switching to non-fossil fuels, refraining from detonating weapons of mass destruction and putting the population on a strict vegan diet. You can also introduce an 'evil empire' to spice things up. This is played by the computer - as an economic bully boy seeking world dominance through industrial blitzkrieg, or as a warmongering junta who would sooner nuke the planet than share it with anyone. Anyway, your main aim is to build up a civilisation without treading on Mother Nature's toes. Building up a settlement involves piecing together components such as city blocks, farms, mines and power stations. You'll also have to furnish each city with a fresh water supply and sewage works. You can put your nation on a war footing via the Battle Menu. The first thing to do here is to set up your own bunker, an air-conditioned stronghold from which you can conduct thermo nuclear Armageddon. Then you can construct missile bases, airfields, naval dockyards, early-warning radar and anti missile battalions. A battle map shows the current positions of your active units (up to 25 at any one time) and the coverage of your radar network. You can also use it to program in the co-ordinates of that small collection of enemy trees you want to wipe off the map. Martin: By the nature of the subject matter, a world sim tends to be a bit on the complex side. While ideally it should be realistic, you don't want the game to suffer through being over-complex. As part of their global warming studies, the Meteorological Office uses Cray super-computers to model the atmosphere, with programruns that can last months. Now, although gameplay is far from addictive, scientists still take the results with a pinch of salt. At the other end of the scale, Global Effect simulates, on a 16-bit, the interaction of industrial, environmental and military factors in managing the world balance. So as you can imagine, Millennium has cut a few corners to make it user-friendly. It's certainly easier to use than Sim Earth, so you don't need to be Jonathon Porritt to understand what's going on. However, the game does suffer from trying to spread itself too thin, and the choice of which environmental factors have been included and which ignored seems to depend on what's fallen off the bandwagon. Irritating bits include the delays while the computer generates each map, and the inconsistencies of time scale which result in missiles taking five game-years to reach their destination - the Royal Mail could deliver a warhead faster than that. However, for all that it is great fun to play, I have to admit I was a bit of a fascist meathead and played it as a battle sim. But I'm sure that it would be just as much fun if you were to smear yourself in Body Shop products, put an album of whale music on your Walkman and set about turning back the rising sea levels and plugging the holes in the ozone layer. Are you worried about the weather, about polar ice caps melting and the imminent possibility of the disappearance of Grimsby? Or does the price of strong lager play on your mind? Global Effect offers you the chance to save a damaged world or build yourself a new one. And if waging war is your cup of tea, then you can do that too. Power and responsibility are the qualities needed to be a good God. But building vast cities means that you have to then power them, provide sewers, reservoirs and all the other bits and pieces that the population need. And if the balance is wrong, the place falls around your ears. Getting such a balance is difficult, particularly for the beginner and this makes Global Effect a rather frustrating exercise to begin with. But the attention to detail is excellent, the control system is certainly manageable and for those with a warm feeling for the globe (and the patience of Job), Global Effect could well prove a rewarding experience. Vor zwei Jahren veröffentlichte Millennium eine Öko-Simulation, die dank ihres komplexen Gameplays und vielfältiger Szenarien einen Achtungserfolg verbuchen konnte - die neue CD-Version ist dagegen eher Sondermüll! Durch einen vermeintlich kleinen Schnitzer wurde nämlich der ges:amte Sinn und Witz zunichte gemacht: Es lassen sich keine Spielstände abspeichern! Das entsprechende Icon der Diskversionen fehlt, wer also mal ein Päuschen einlegen will, darf anschlißend wieder von vorne anfangen, und nur in einigen Szenarien werden zumindest die Highscores gerettet. Damit nicht genug, denn während die Menüs in vertretbarem Englisch beschriftet sind, kommt die wichtige Nachrichtenzeile in reinstem Franzözisch daher. Und selbst wer diese Einschränkungen in Kauf nimmt, wird bestrafft, quittierten unsere beiden Test-exemplare den Klick auf das Info-Icon doch verläßlich mit einem Systemabstürz. Interessiert es unter diesen Umständen überhaupt noch jemanden, worum es hier geht? Okay, der Vollständigkeit halber Stampfe à la "Sim City" Häuser aus dem Boden, versorge sie mit Strom, Wasser, Kanalisation etc., und achte vor allem darauf, daß mit fortschreidener Zivilisation die Ökologie Deiner Welt nicht aus dem Ruder läuft. Das Ganze ist wie gesagt in allerlei Szenarien mit diversen Problemschwerpunkten (Eiszeit, Umweltverpestung usw.) allein oder gegen einen Digi-Gegner spielbar. Mausi funktioniert prima, das Pad ist etwas gewöhnungsbedürftig, und der Sound wäre mit einer erträglichen Titel- und Begleitmelodie samt drei oder vier FX-Piepsern unter ferner liefen einzuordnen. Fazit: Es ist schon erstaunlich, wie sich mit wenigen Kniffen ein ordentliches Spiel völlig ruinieren läßt.